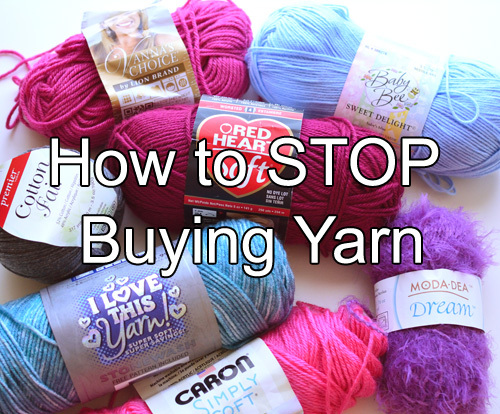 Why would someone ever want to stop buying yarn? Perhaps you’re on a tight budget or you already have an entire closet or room full of yarn you haven’t used yet. While this post’s title might seem ridiculous to some, I know there are a bunch of yarnaholics out there that might need a little (okay, more like a lot) of help taming their buying impulses. So how do you stop buying yarn? Here are a few tips below. Feel free to share your ideas in the comments and see what others are saying! 1. Make your current yarn more accessible and organized. If you’re stash is large, try organizing your yarn so that you can easily see what you have and reach what you need. Without the hassle of digging through multiple bins of yarn to find what you need, using up your stash is much easier to do. 2. Find projects that use your existing yarn stash. If you come across a pattern that you must crochet, try to match it up with a skein of yarn you already have that’s waiting to be used. If you don’t have a suitable yarn match, put the pattern at the end of your to-do list for now (see step 6). 3. Crochet Scrap Yarn Projects. Scarp yarn projects, as the name implies, uses scraps of yarn. We all have those random, leftover scraps so why not put them to use? Scrap yarn projects can be small items such as coasters, appliques, or even jewelry. It can even be a large blanket that uses small amounts of a lot of colors, such as the Kaleido Blanket. 4. Stop teasing yourself by visiting craft stores. Every time I walk into a craft store, even if it’s not to purchase yarn, I end up in the yarn aisles. I’m guessing it’s the same for you. So don’t even bother taking the trip to the store (or visiting a yarn website) if you’re on a yarn buying hiatus. When the itch to visit the craft store comes around, and it will come, open up your existing stash and admire that instead. 5. Trade yarn instead. You don’t need to buy yarn to get it. Maybe you have a friend (online friends count too) that has a perfect colored yarn for your project and you may have something she just loves. Do a switcheroo and the problem is solved. 6. Budget how much you can purchase each month. Okay, this isn’t actually stopping the buying, but it can help to limit the habit of purchasing too much. Set a goal and stick to it. Maybe even give yourself a reward for being under budget, such as an extra few hours of crochet time! Do you have tips to thwart yarn buying? Are you a yarnaholic? Leave your comments below! This entry was posted on Friday, October 20th, 2017 at 12:00 AM by Rachel Choi	and is filed under Fun Ramblings, Tutorials and Help. You can follow any responses to this entry through the RSS 2.0 feed. You can skip to the end and leave a response. Pinging is currently not allowed. Thanks…I needed this. I just “culled the hoard” and will donate a grocery bag full to the Senior crochet group I attend weekly. Mostly baby yarn and gifted Simply Soft. My hands like 4ply better. 1. To avoid internet purchase: Change the settings on your computer and monitor until everything looks like creamed spinach with chunky beets and oily asphalt. Unless that’s your favorite color. Ewwww. 2. To avoid non internet purchases: Go to the race track and bet all your yarn money on the worst looking horses. You’ll have to borrow a pair of blinders to get you past the yarn concession. Trust me, if they know you’re coming, they’ll build a yarn concession in the racetrack. 3. To avoid all purchases: Lock yourself in a tower and wait for your hair to grow long enough to let you escape. If you bring your spinning wheel to spin your hair, this may never happen. But you’ll be so busy spinning new yarn, you’ll still have a problem. 4. Why bother? Enjoy life! Great suggestions, Kitten! Especially #4!!! I can KEEP that one!!! Great suggestions, Rachel! My goal for this year is to not buy anymore yarn. The exception is if I get an order that requires new yarn (I have an Etsy shop). So far, I’ve only cheated once, for a skein of Shawl in a Ball by Lion Brand. I’m “Cold Sheeping” this year. I put it in quotes because I didn’t follow all the organizational rules at the beginning (and I still get surprised at how much of my stash isn’t already logged on Ravelry), but I find it’s helped to keep me from making random yarn and fiber purchases outside my festival exception. That said, it probably would have helped me be more productive with my knitting and crocheting if I had actually logged all my stash. It’s just like tip #1. LOL 🙂 When I starting buying yarn, I needed to make 9 baby blankets. Well, when I finished that, I get emails from Michaels, AC Moore and Jo Anne’s. I’m hooked on those damn emails! I love getting a bargain. AC Moore has a wonderful selection of soft and colorful yarns. Even women in my knitting groups are trying to help me slow down. Good luck to all the other spenders. Lol. Good tips. Except that I can’t avoid Craft Stores. I work at a Craft Store! I walk down the yarn isles and repeat – “must not buy yarn, must not my yarn”. Hi, I honestly read your entire article & figured “I can do that”. Yeah, right. What’d I do? What else, went to Hobby Lobby AND A.C. Moore & bought nearly $100 worth of yarn between the 2. Oh, woe is me. I’m doomed. DOOMED, I tell you.